The Campbell Estate, owner of the 1.8-acre downtown parcel that houses the Fort Street Macy's store, has put the property up for sale. The estate listed the fee-simple site yesterday with the commercial real estate brokerage Colliers Monroe Friedlander, which is marketing it as one of the last developable parcels of its kind in downtown Honolulu. The "superblock" property has already gotten more than 100 inquiries from potential buyers, said Mike Hamasu, director of research and consulting for Colliers Monroe Friedlander. "There are very few available sites in Honolulu that are zoned for mixed-use development and have a 450-foot building height potential," he said. The site is in the heart of Honolulu's central business district and includes the Empire Building and Macy's downtown retail and parking complex. 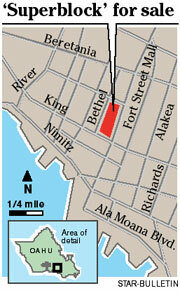 The property is bounded by Fort Street Mall, Hotel, Bethel and South King streets. While the broker has not set a price, Hamasu expects commercial buyers will drive purchase bids to more than $35 million. The buildings on the site, which total more than 200,000 square feet, generate net operating income of $1.6 million, Hamasu said. "Competition for this property will be fierce," Hamasu said.